We’d love your help. Let us know what’s wrong with this preview of The Heirs of Fortune by Heather Domin. To ask other readers questions about The Heirs of Fortune, please sign up. Same question as previous--when will you be issuing this in paperback? I am not an eReader. Thank you. When will you be releasing Heirs of fortune in paperback? I absolutely adore Soldier of Raetia and am waiting with baited breath for this sequel. Thank you. Heather Domin Thank you for that! I'll definitely be putting out a paperback, hopefully by Christmas or New Year's. For anyone who saw my review of Heather Domin’s The Soldier of Raetia, you may recall one of the many things I loved about it was the writing itself. Domin’s voice is mesmerizing, the sort of wordsmithing that allows her readers to disappear into her characters’ lives, their trials and tribulations and to feel their grief when they lose a brother in arms in battle or in betrayal. This is not a soft-sell, romanticized portrait of what it meant to be a Roman soldier in 10BC. Rather, it offers a be For anyone who saw my review of Heather Domin’s The Soldier of Raetia, you may recall one of the many things I loved about it was the writing itself. Domin’s voice is mesmerizing, the sort of wordsmithing that allows her readers to disappear into her characters’ lives, their trials and tribulations and to feel their grief when they lose a brother in arms in battle or in betrayal. This is not a soft-sell, romanticized portrait of what it meant to be a Roman soldier in 10BC. Rather, it offers a believable impression of what it was like to be a soldier encamped for weeks in less than ideal conditions—the cold, the mud, the waiting, and the fierce brutality of armed combat, not with guns and missiles across a vast expanse of landscape but hand-to-hand with swords, daggers, spears and axes, and the personal nature of seeing a man’s face as he dies a bloody death. 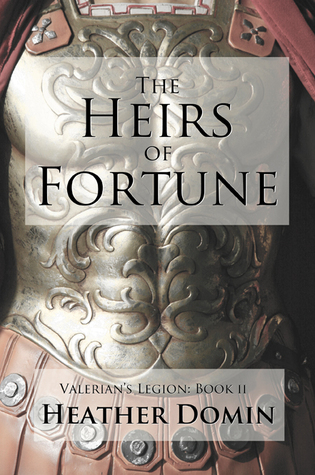 The Valerian’s Legion series is what is coined realistic fiction, that contradictory term used to encompass a novel that offers the author’s imagination the realism that allows readers to believe the story could have happened in the precise way it plays out in the recounting of what it meant to defend Rome and to conquer her enemies. Among it, it is the story of General Cassius Valerian and his tribune and heir, Manilus Dardanus, and how the topography of their relationship is influenced by everything around them—the rules of a society which demands they maintain the appropriate facade in public so no one suspects what they do in private, for Dardanus to marry and further his lineage, and the very real possibility of death in battle. Readers also play witness to Valerian’s own internal battle, which dictates his every action towards Dardanus in this novel. Doing what he believes is right, to the point it nearly destroys everything they are to each other. Consul Nero Claudius Drusus Germanicus features prominently in The Heirs of Fortune, and in the Afterward Domin expresses how little, comparatively, is known of Augustus’ stepson, which is advantageous for the author as it allowed her to flex her creative muscles a bit, which she does so impressively (if you’re at all interested, though, Google him: his descendants are well known). Domin captures the personality of the twenty-nine-year-old warrior—charming, bold to the point of brash at times, fearless to the point of being reckless as well as the absolute loyalty given him by his soldiers. In fact, it’s Dardanus’ admiration of Drusus that heralds in what became an escalating friction between Dar and Valerian. Seeing them at odds for the greater part of this book wasn’t easy, but it deepened my investment in their relationship all the more for it. The might of the world’s greatest military didn’t often invite challenge, but there were tribes who took umbrage to Rome’s penchant for razing villages and making slaves of the people, and those men would attack, a key element in Drusus’ role in the book, leading to an ultimate and untimely demise. One thing Domin makes clear is that Roman politics hasn’t lost its influence over the millennia. Diplomacy as an art form that, when paired with savvy, prevented war. I am so in love with this series. Love the characters, love the history, love the affirmation of the love Valerian and Dardanus feel for each other, and love Heather Domin’s writing. The only thing I don’t love is that it’s been three years since this book was published, with no idea when to expect book three, Valerian’s Legion: The War of Illyria. This sequel is a direct continuation of book one and as such cannot be read as a standalone. To understand the bond between Dardanus and Valerian, readers must know how and where they began, which made seeing where it went here so heart wrenching. The twenty year age difference between them is, in some ways, significant as it’s difficult to tell how much of Valerian’s actions and responses are attributed to his accumulated life experience, how much is his personality, and how much is the fear of how deeply he loves and needs Dardanus. Highly recommended for fans of historical fiction. Not only was this exciting and moving, it's so beautifully written. I expected no less, but this was just wonderful. I was excited to read this continuation of Dardanus's and Valerian's adventures. Well written novel of the further maturing of a young man fighting with the legions in Germania under Drusus Germanicus. I liked the personal story between Valerian and Dardanus--their differences over the ambitious Drusus. These and other attitude differences bring them to an impasse. How will they repair their tattered relationship? The author brought in Dardanus's friends and others from the first novel and has i I was excited to read this continuation of Dardanus's and Valerian's adventures. Well written novel of the further maturing of a young man fighting with the legions in Germania under Drusus Germanicus. I liked the personal story between Valerian and Dardanus--their differences over the ambitious Drusus. These and other attitude differences bring them to an impasse. How will they repair their tattered relationship? The author brought in Dardanus's friends and others from the first novel and has introduced us to more sympathetic characters, especially the young slave boy, Karwe. I loved Heather's descriptive nature passages--reminiscent to me of Bryher in her Roman Wall: A Novel. overall, just as in the first book, the whole depiction of the setting is great. What I expected was maybe to see the characters more as humans, not so much as heroes. I wished they would surprise me, I hoped to think and feel with them. In stead, I felt more like a bystander, and they were more untouchable than ever. Which I didn't really expect, since the first book laid the foundation for different understanding on the image of the Classical Hero. As far as I checked, the author is planning on writing a third book- Valerian's Legion: The War of Illyria - maybe that's where the surprises I hope for will be. I enjoyed it even more than the first book! A nicely crafted period tale (Germanic forests setting mainly) ... good arc and resolution. Some good battle/action sequences and naturally lots of tension/pull between our May-December M-M pairing. The book ending sets up nicely for the next book in the series set elsewhere in the Roman empire (middle east). It took me a while to finish this because, it kinda lost it's touch.